I was born in Newcastle and have lived in the North East for all of my life (minus a 3 month stint in Dundee but let's not mention that). It is my job to share events and days out across the region so it may come as a shock that I've never stepped foot in Exhibition Park. I've walked past it hundreds of times but never actually ventured inside. 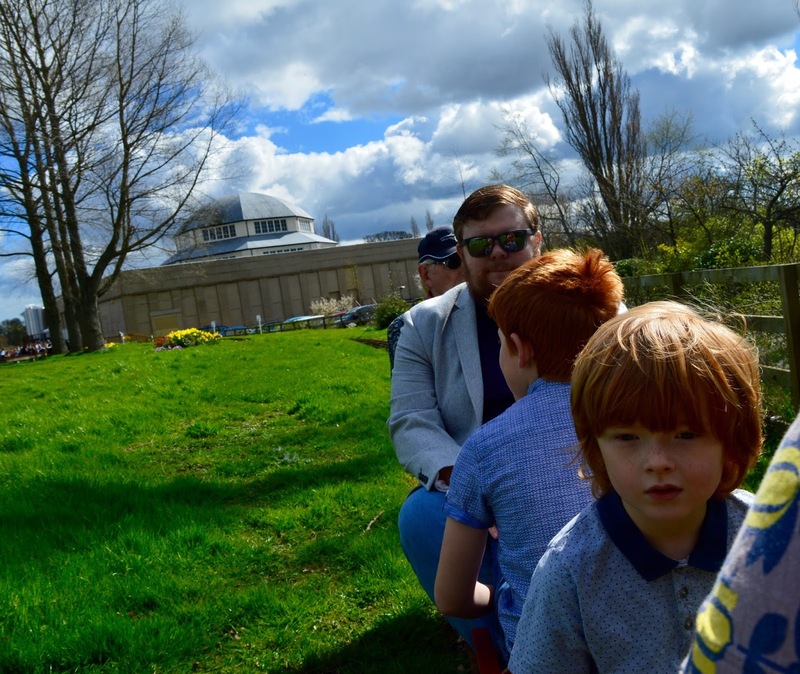 The sun was shining last weekend and Wylam Brewery invited us down to check out what the park can offer families. I am so pleased we made the effort as it turns out that Exhibition Park is lovely. We parked in Claremont Road car park which is £3 for all day on a Sunday or £1.30 per hour Monday-Friday 8am-6pm. The car park is just by Exhibition Park's entrance - use post code NE2 4AA. 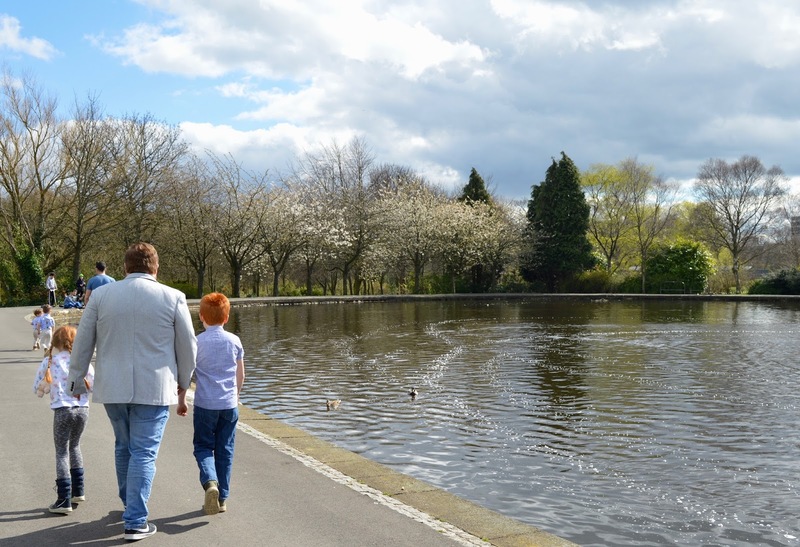 We were definitely blessed with the weather during our trip and started with a walk around the boating lake. There were families with model boats sailing around the lake and we vowed to bring ours during our next visit. The spring flowers were in full bloom and I bet when the trees are covered in leaves and blossom in a few weeks time, the setting will be even more stunning. 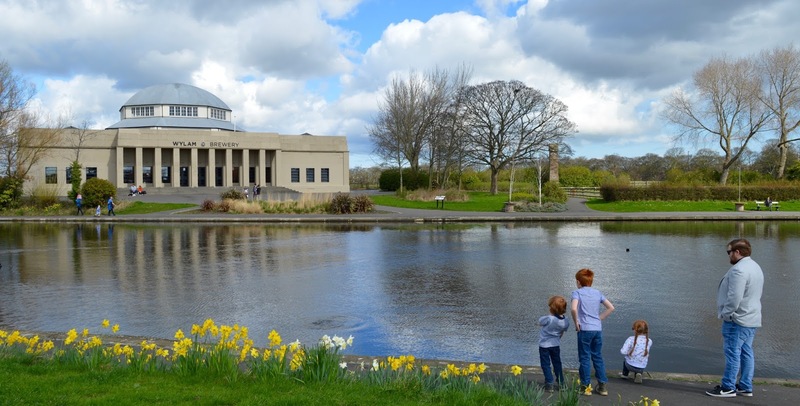 The walk is short but if you have sprightly toddlers you might want to keep them in their pushchair or on reins as there is no fence or barrier around the lake. We spotted a few ducks and swans too. 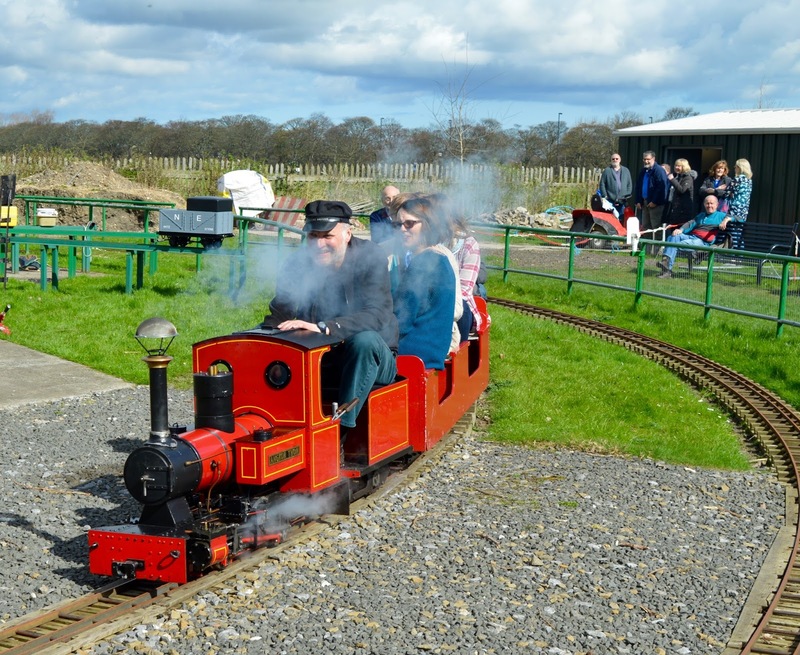 When I posted a video from our ride on the free miniature railway in Exhibition Park on my Facebook page, a few people were shocked and said they'd never heard or noticed it before. 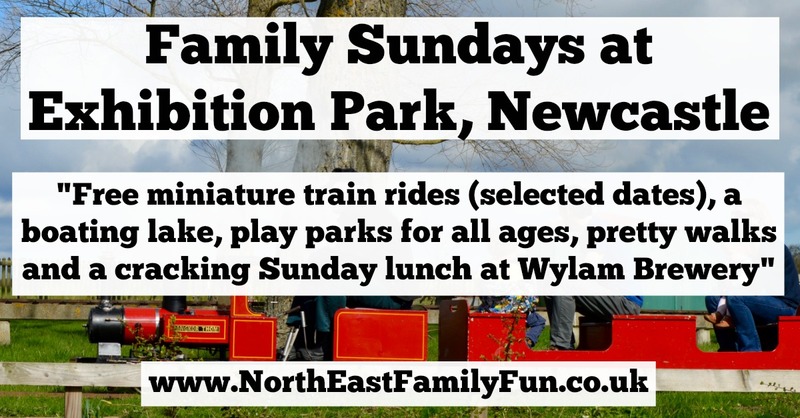 The railway is located just behind the Wylam Brewery building and runs on the first Sunday of every month from 11am - 3pm from April - September. The train is organised by volunteers and free to ride - just turn up. Donations are welcome though so please dig deep. 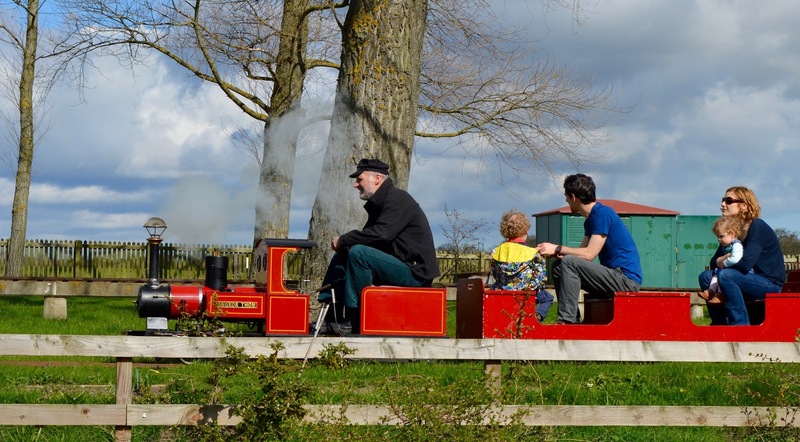 We all loved it and the trains are enjoyed by everyone from babies up to grandparents. The next public running will be Sunday 7th May - put it in your diary now. You can keep up to date with dates/times over on the Tyneside Society website or their Facebook page. 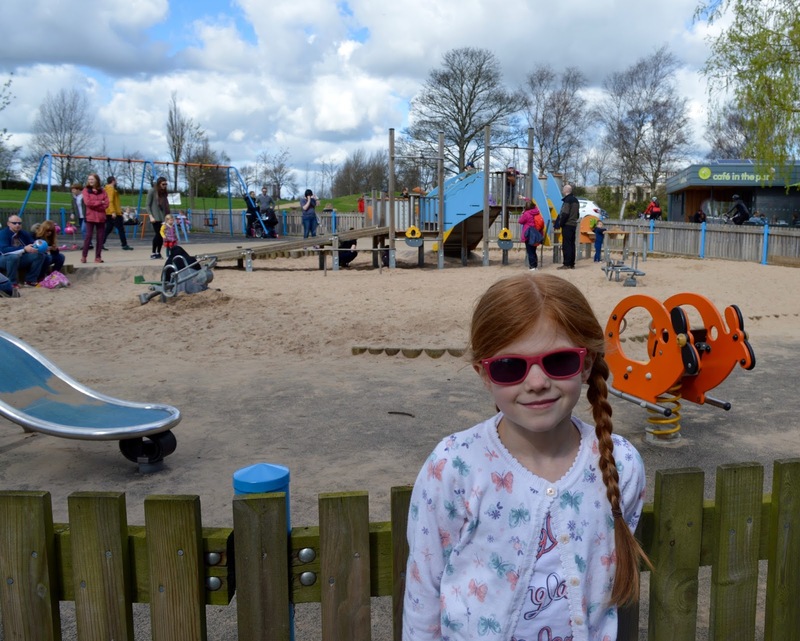 There are a few different play parks to try out in Exhibition Park and they are all next to each other so it's ideal if you have children of different ages. 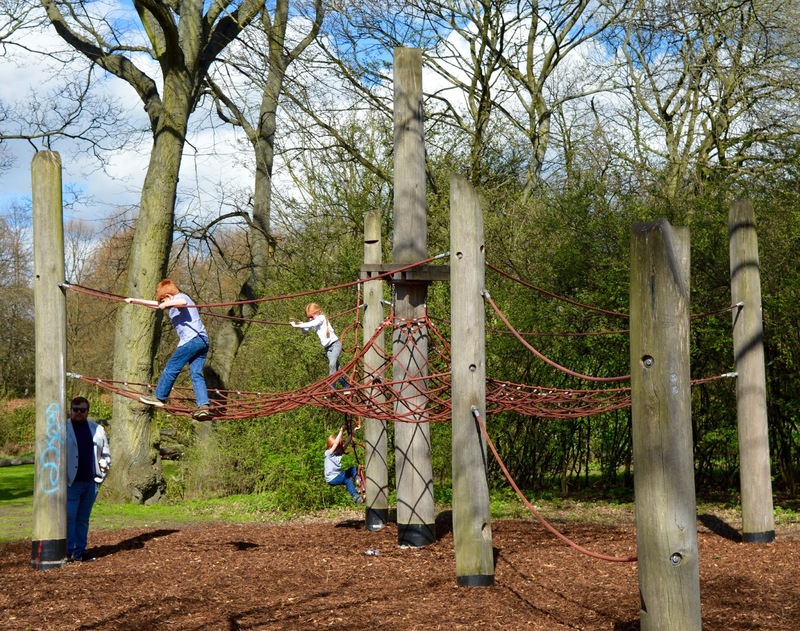 We tried out the younger kids park, the older children's adventure playground and the hidden assault course and outdoor gym equipment too. The parks are big enough for your children to spend an hour or two and there is a cafe overlooking the parks too. Their ice creams are recommended! 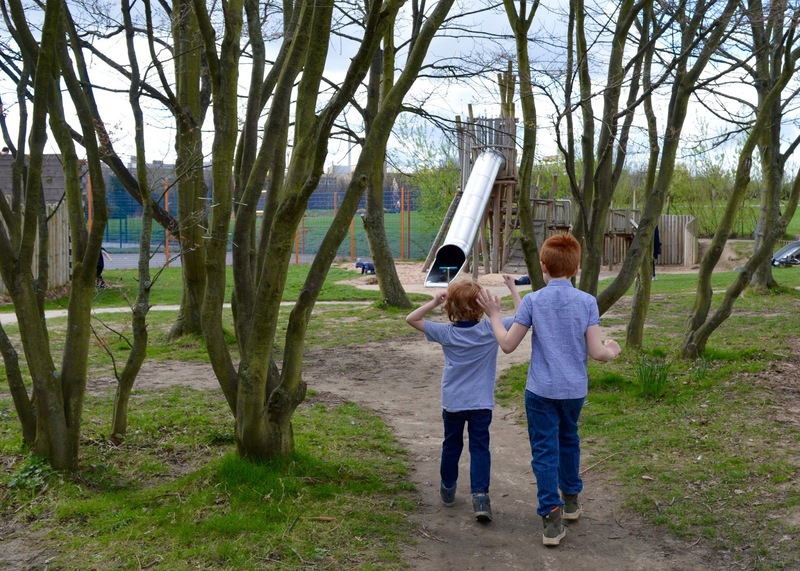 As well as traditional play parks you'll also find a skate park (popular with children and their scooters), tennis courts and a multi-sports court plus of course lots of grass and places to play hide and seek. 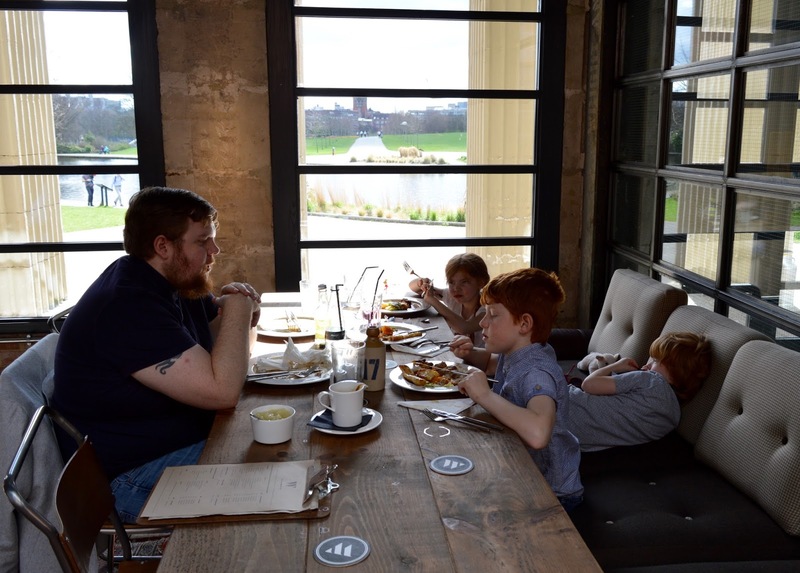 Spending your time playing in the park can be exhausting so we headed over to Wylam Brewery where we had a 1pm reservation. You can't miss the building overlooking the lake. There is a dog-friendly bar area serving food and also a larger dining room where our table had been booked. 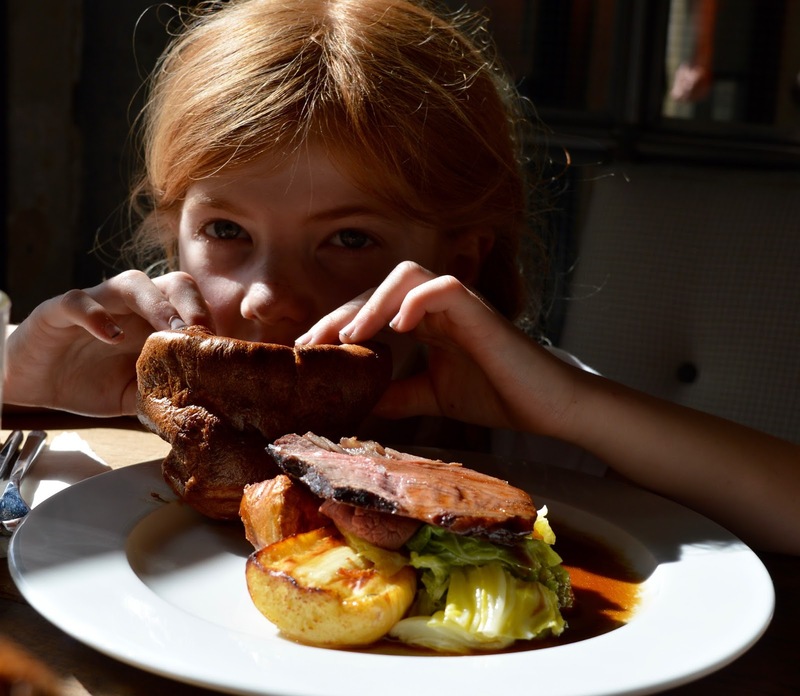 Our seats had a perfect lakeside view and the space was filled with families enjoying Sunday lunch. High chairs are available. Due to the space being very open, we did find it to be quite noisy and I'm not sure I would recommend a visit if you are hard of hearing, would like a peaceful lunch or want to sit down and have a large group conversation. We could hear each other around our table but at times I struggled to hear our server at the end of our table and vice versa. 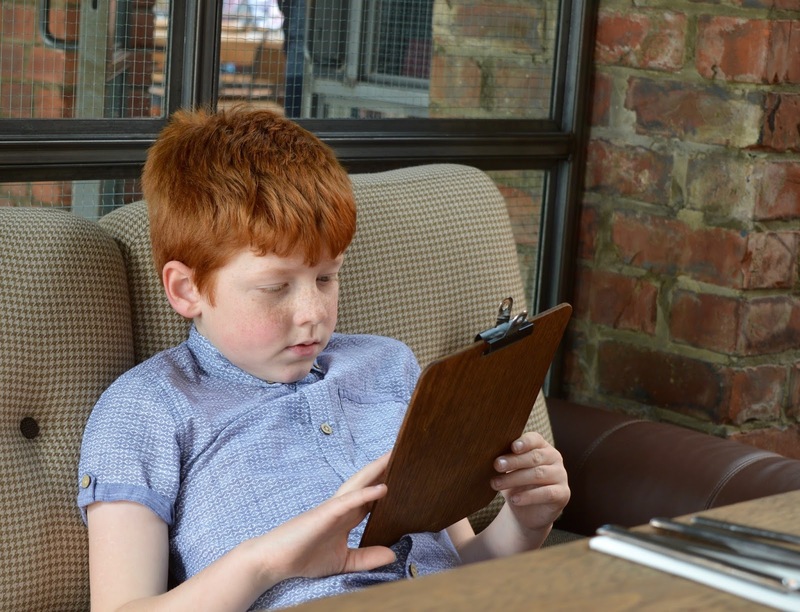 If you are looking for a lively space where no one will raise an eyebrow if your kids start banging their cutlery on the table, this is the place for you. We ordered our drinks and Steve was chuffed to bits to find a smoked beer on the menu. Steve loves a smoked beer but not many places serve it. 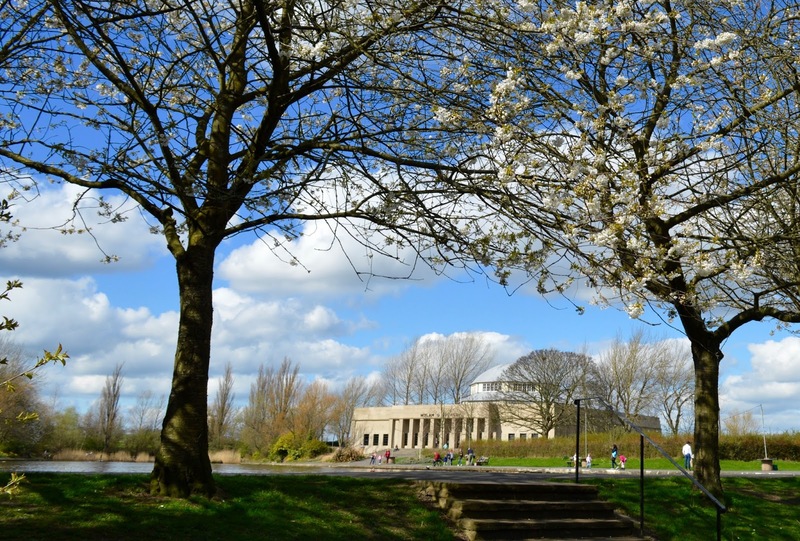 Now that we know Wylam do, I know we'll be back time and time again. He actually looked like he was in heaven as he took his first sip. I had a taste and I agree with Steve's description that it tastes like a platter of meat - it's not exactly to my taste but he loves it. If you're after something a little different, give it a try. 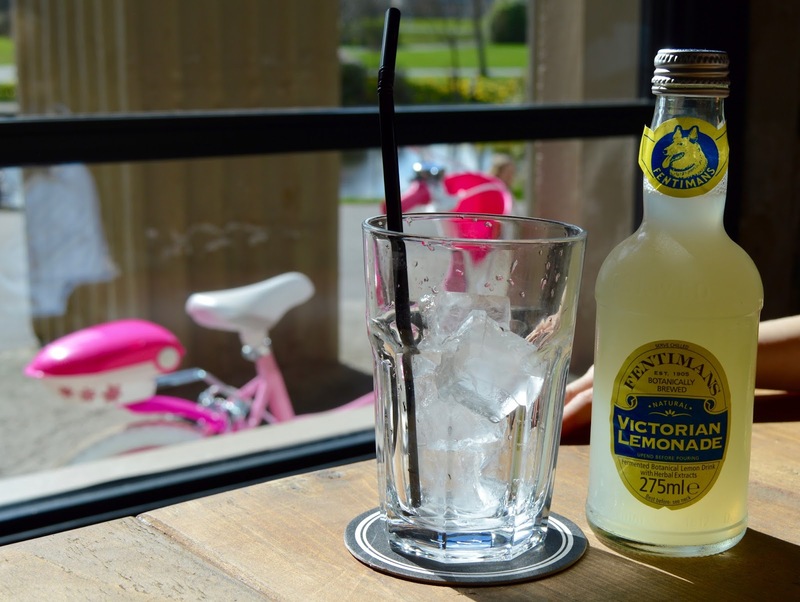 I stuck with a classic Fentimans lemonade which I always think tastes so much better in the sunshine. There is cordial/fresh juice, water or pop available for children too. 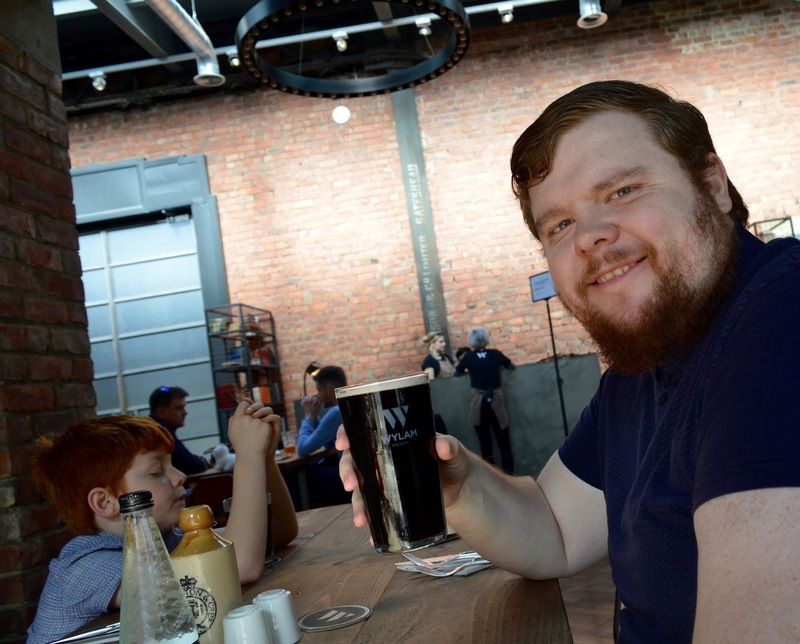 Wylam Brewery is an example of a place that does one thing on a Sunday, but makes sure that they do it very well. 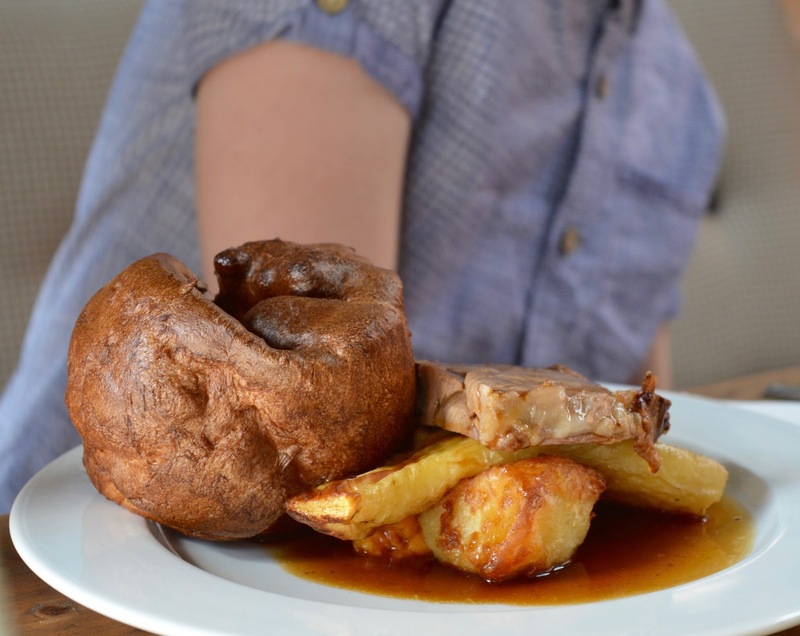 There are just four main courses to choose from and no children's menu to speak of but if you're after a roast dinner, this is the place to come. Children can order a half portion. To start we went with two plates of cured meats to share between the five of us (£7 per plate). 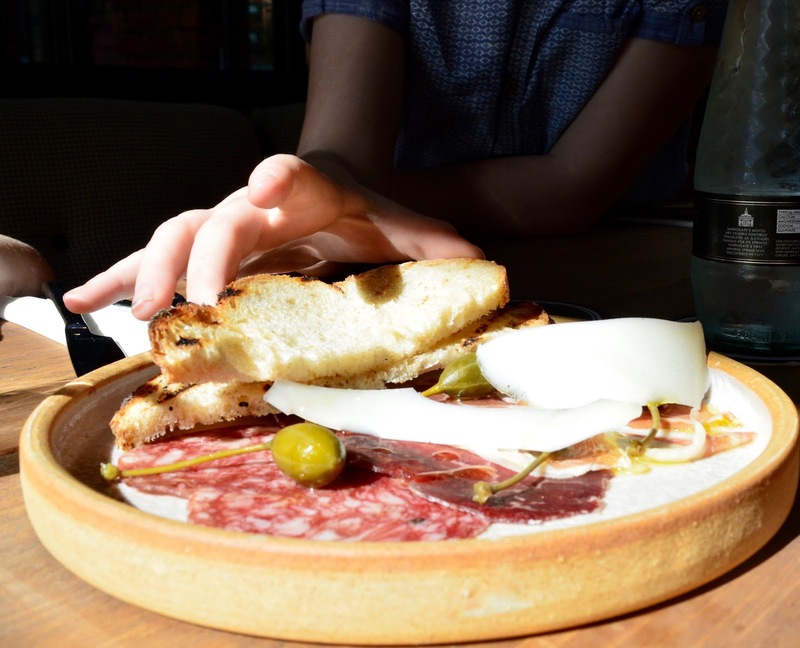 The kids enjoyed the sourdough bread and Steve and I devoured the cured meats and cheese. Looking back, I think we should have ordered three plates between the 5 of us as I didn't get a look in with the bread. Other starters include a roasted squash salad or wild mushroom and lentil soup. 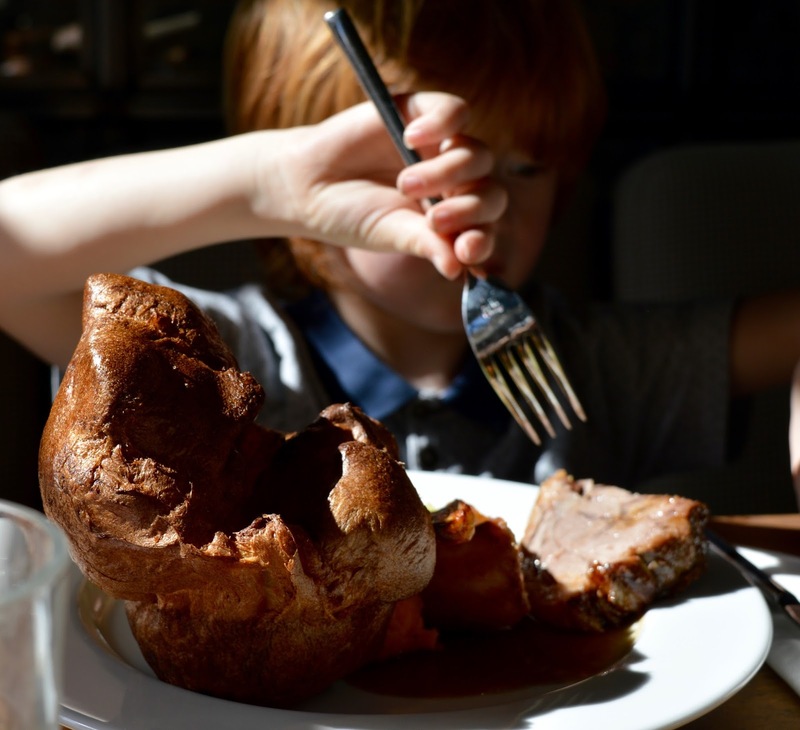 Children can order half portions (at half price). They are pretty big portions and will definitely fill them up. 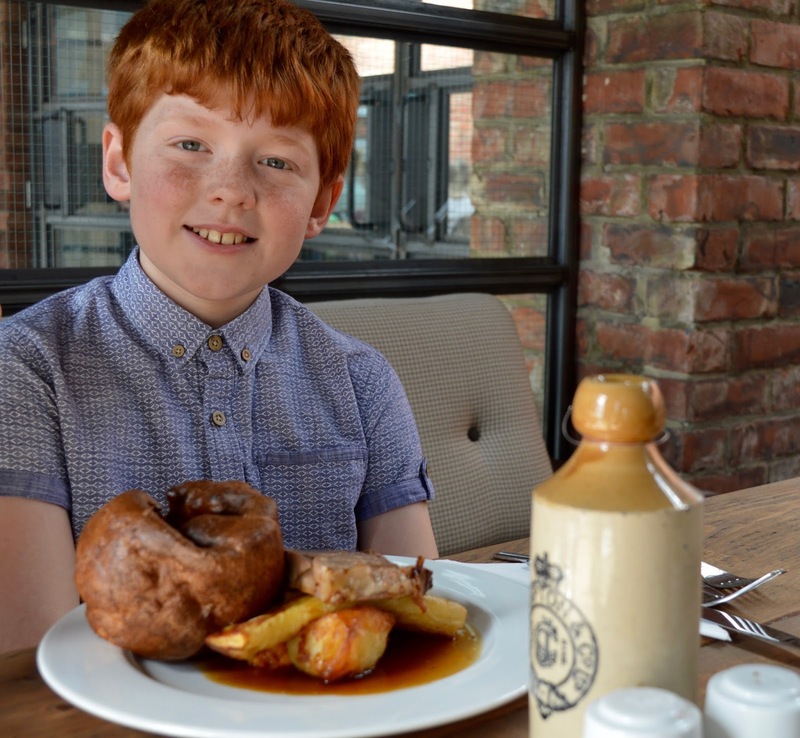 Roasts are served with bashed roots, roasties, glazed parsnip, buttered greens a yorkshire and gravy. We ordered the pork, lamb and beef between us so tried a little of everything and were very impressed. 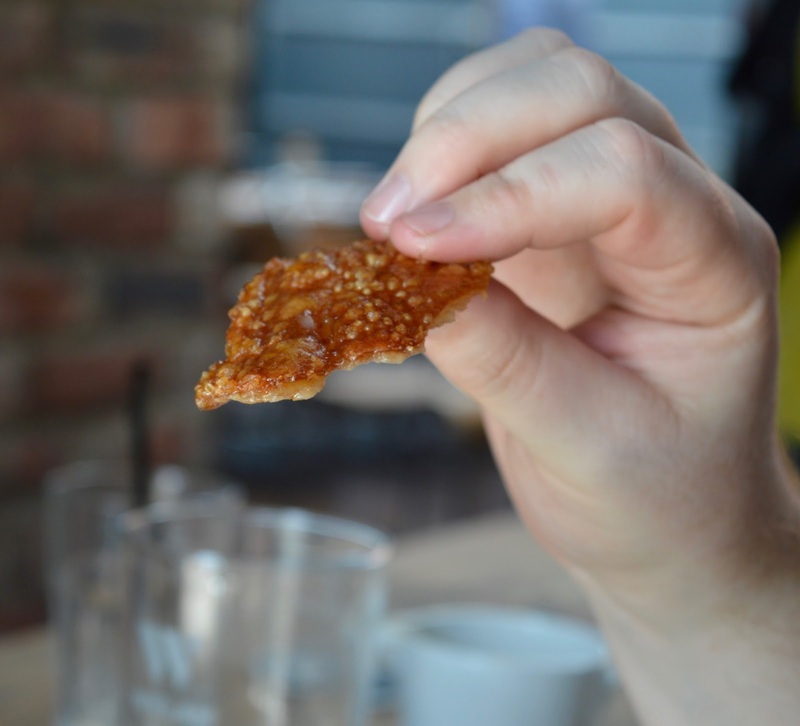 Everything was pretty perfect - the meat was of high quality and all nice and tender, I had severe crackling envy at Steve's dish and will definitely be ordering the pork next time. The yorkshire was homemade and huge, the bashed vegetables were lovely and creamy, the parsnip was beautifully caramalised on the outside yet nice and soft on the inside, the gravy was full of flavour (tasted like a few glasses of red wine had been added to it too) and not too thin. We were also given an extra jug for our table and finally, the roasties were homemade and perfectly crisp yet fluffy too. 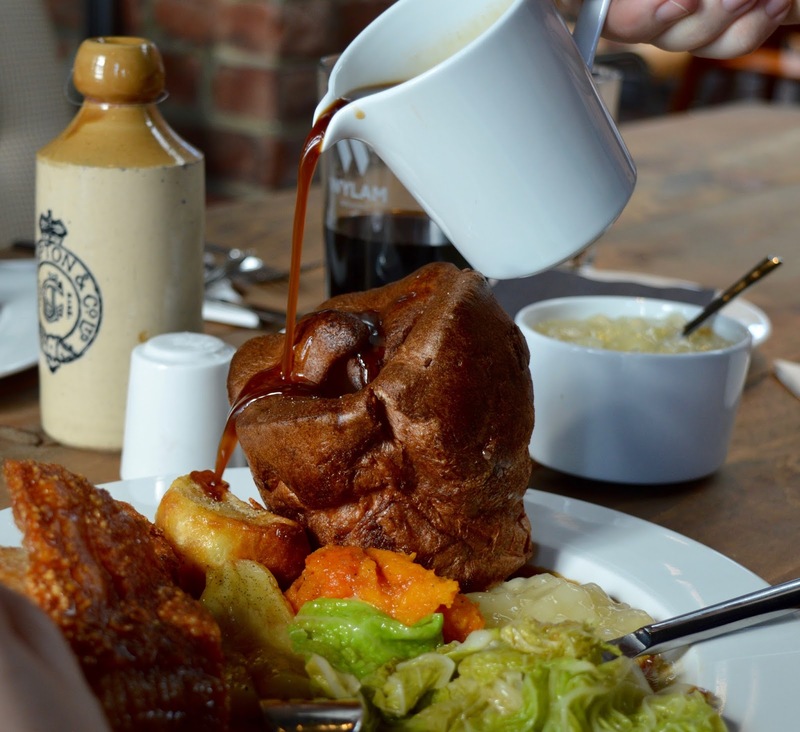 As Steve and I tucked in we commented that we think Wylam Brewery's Sunday lunch is the best we've had this year. It was delicious. We enjoyed our main courses so much that there were clean plates all round and we were far too full up to contemplate dessert. I was tempted by apple crumble and custard but ordering it would have just been greedy so I declined. Next time I'll be skipping a starter and try to save room for pud. We'd eaten so much food that we decided on another walk around the park to try and feel a little less full and it worked. I loved looking at all of the spring flowers and if you're looking for a place with lots of daffodils, I recommend a trip. 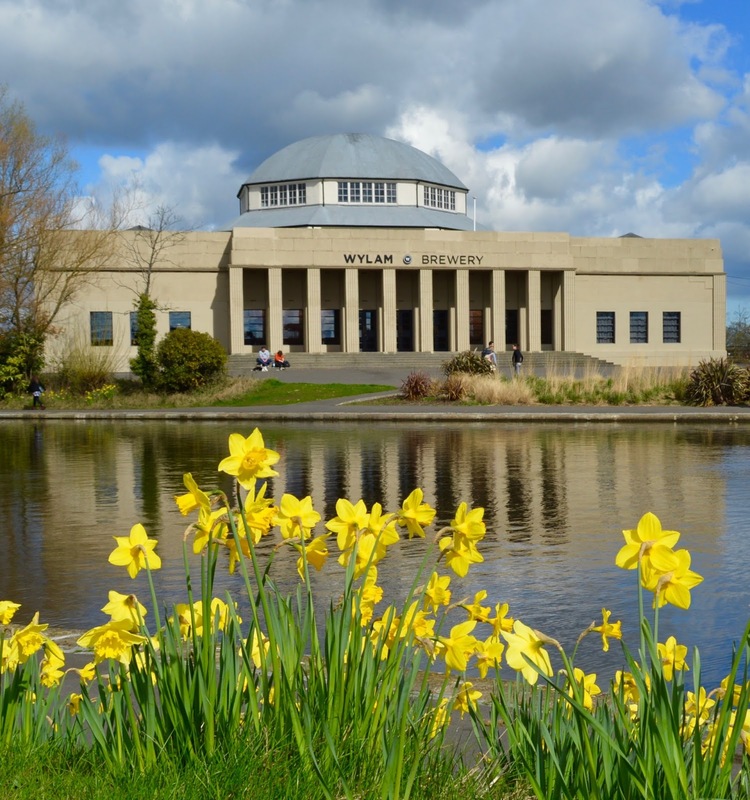 Would I recommend a trip to Exhibition Park and Wylam Brewery to families? Absolutely! It did help that we were blessed with good weather. 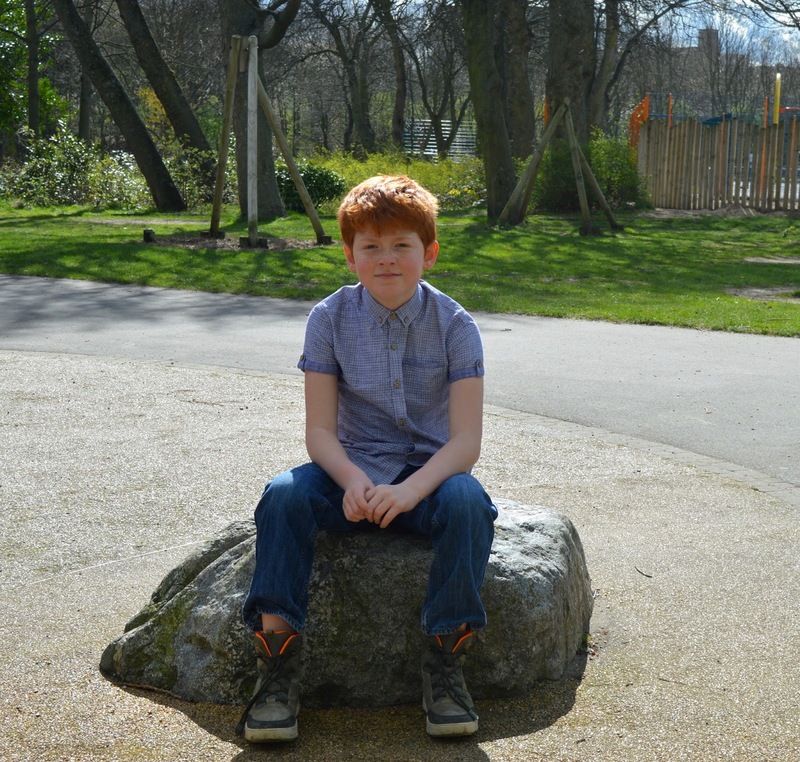 The park was filled with families having fun together in the sunshine and our lunch was a nice and relaxed affair. 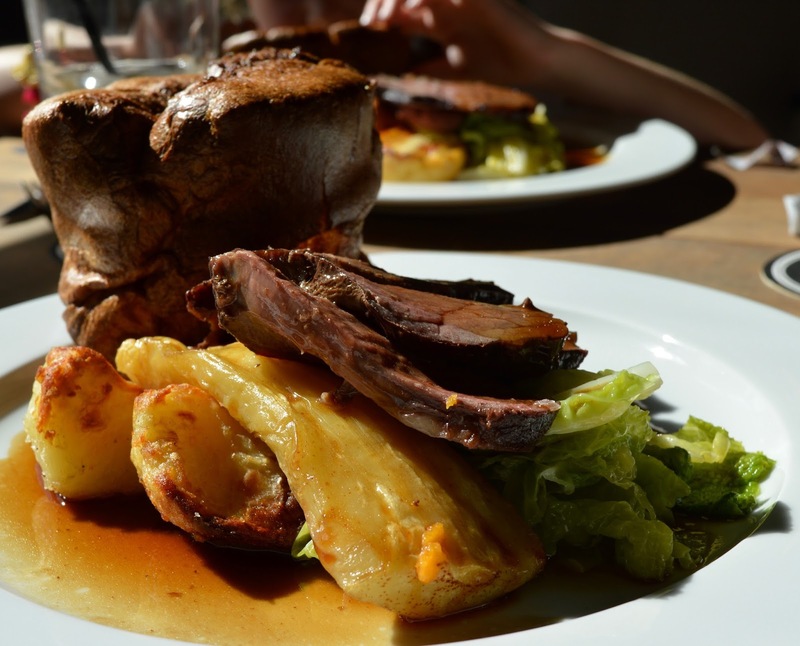 In our opinion, it just beats the Sunday lunch offering at both The Broad Chare and The Cherry Tree which are two of our favourites. 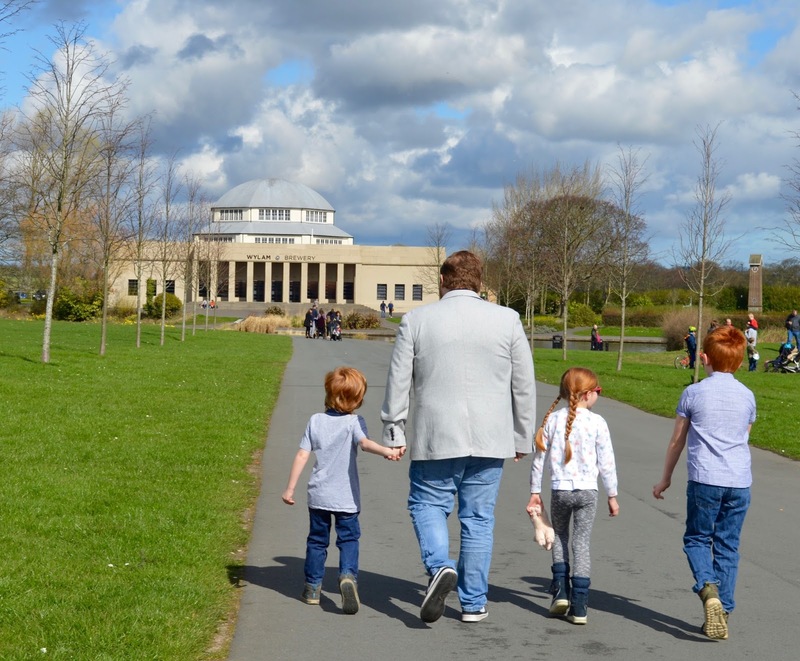 If you're looking for a place to visit that serves a cracking Sunday lunch and has lots of facilities for kids to enjoy before/afterwards, Wylam Brewery and Exhibition Park definitely fit the bill. I recommend the pork. It is worth noting that Wylam Brewery also cater well for Vegans (check out this review by Canny Food). Oh wow the food looks good! We had a stroll through the park last Summer and really wanted to visit the Brewery but it was closed - we weee looking through all the windows and it looked so lovely inside. 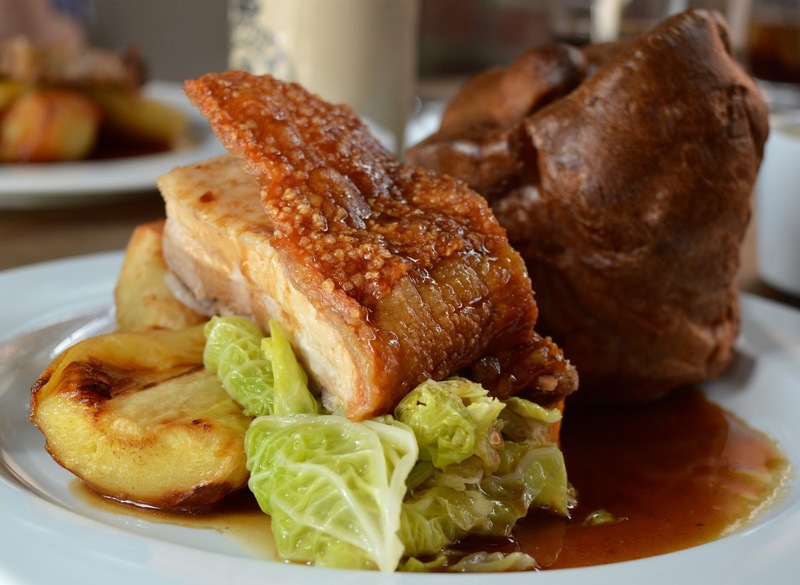 We have a friend visiting next month so may take her here for some Sunday lunch!